I thought I had another year before dealing with all this. Most kids wait until they are 6 or 7. And with The Phi not getting them until about 9 months I thought for sure she would loose them late too. 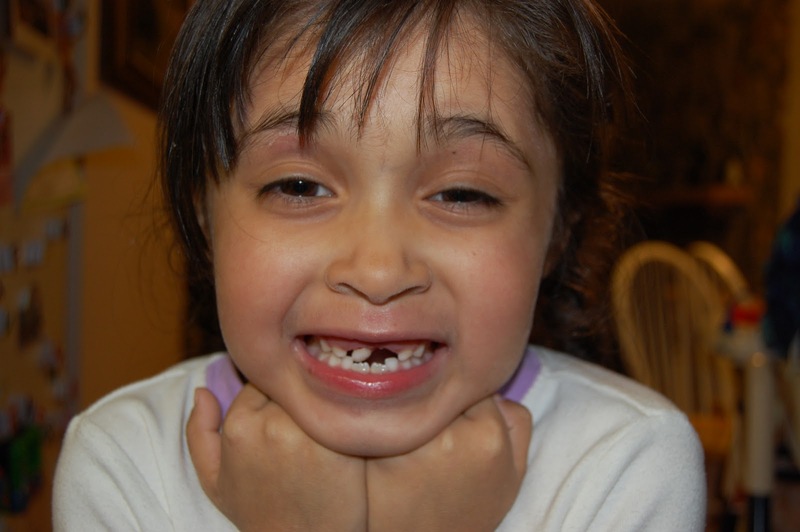 But no, my little overachiever has now lost a total of 4 teeth. The bottom 2 came out pretty quickly once they got loose. The top front were are another story. Those guys were soooo loose for soooo long. 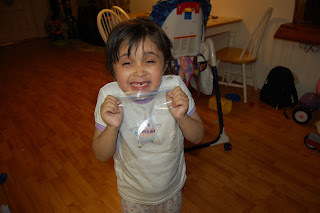 I thought for sure we were going to be tying her tooth to a string and tying that string to the bumper of the car to get them out. Fortunately we did not have to take such drastic measures. On Monday night I put the kids to bed at 8:30 and I had one hour before Joey came home from work. AHHHH peace, quiet, wine, reading! Not even 15 minutes later The Phi comes flying into the den shrieking "Mom! Mom! my tooth!" And there is was in her hot little hand. We hugged. We shrieked. We took pictures. The tooth fairy successfully gave The Phi 3 bucks and things were awesome. I knew that other tooth was going to come out soon. I just didn't know how soon or the drama that would ensue. The next day we sat around the table eating dinner. As a very rare treat I had baked brownies and we were all enjoying my amazing baking skills (that is called sarcasm people). I was in the kitchen with The Phi says "Mom I bit something hard." I didn't think anything of it. Told her she had an end piece and they ends are harder than the middle. I asked her if she ate it and she said she did. "Mom I bit something hard." I looked at Joey and said. I think she swallowed her tooth. This lead to a discussion of where the tooth was and how it was going to come out. The Phi was not amused. 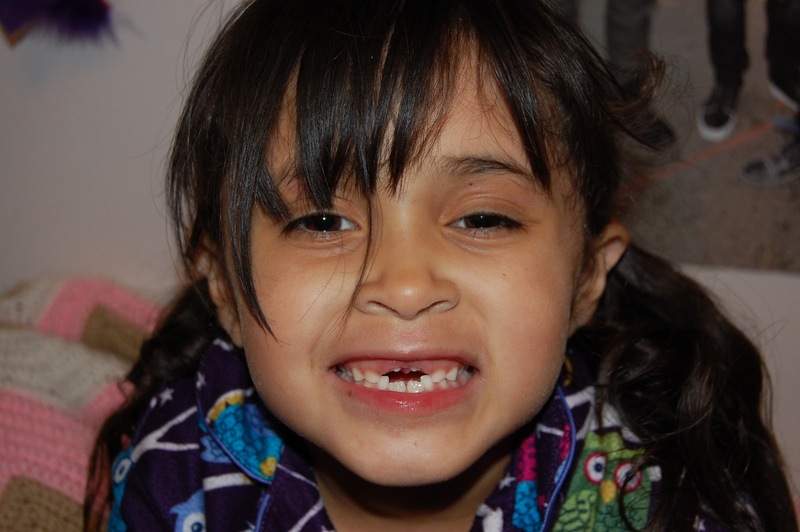 But she was happy to have those loose teeth out! Since we didn't have the actual tooth we had to make do with a cut out picture of a tooth. Just for the record this one was WAY bigger than the tooth The Phi lost, but if she takes after my sisters will be about the size of the new ones that come in. 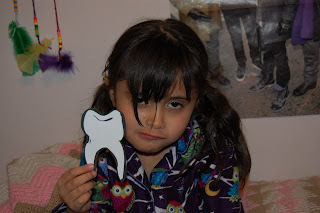 As we placed her "tooth" under her pillow The Phi asked me, "Mom if I leave the tooth fairy a fake paper tooth will she leave me fake paper money?" I told her I didn't know. Since we all know the tooth fairy is quite a joker this is what The Phi found the next morning. Now don't go feel sorry for her. This was taped to the back. Loose teeth totally freak me out. I'm shuddering now just thinking about it. I can't help my girls with the loose teeth, that ranks up there with killing spiders. Aack, that's enough of that talk. $5 is quite a haul for one little tooth, lucky girl! When I was working for GNB I was home on lunch eating a turkey sandwich and one of my back molars split in two and I proceeded to CRUNCH down on the tooth and swallow it. I was so disgusted and freaked out I am sure I never told you guys when I came back from lunch. Ha! Is she good at saving her money or is she like Isabella & like to spend right away?